Christian faith, to me, is a matter of life and death. Before I found Christian faith, life was wearisome, and death seemed easier for a man like me, trapped in a female body in a circumstance where I could see no hope or joy. In 2005 I became Christian, led by an American couple. I didn`t “correct” them when they referred me as “he” until about one year later someone outed me. They apologized for mistaking my gender and shifted the pronoun to “she”. Not only that, they told me transsexualism was sin, and they wanted to help retrieve my gender as God created me–a woman. As a new believer, I didn`t know God and his words well. Taking them as my spiritual mentors, I believed what they said, and I wished I had never been born. If transsexualism is sin, then the way I exist is sinful. How can I love God and at the same time go against him, being transgender, which I can`t help? At a loss to reconcile this, and unable to bear to be known as a sister, I quit church. But God did not forget me. A couple of years later, when applying for a job, I met a man who was a faithful Christian and confessed my identity to him. To my surprise, he accepted me as a brother in the Lord and baptized me. It was then I started to embrace my transgender identity and Christian faith together. Seeking God, I prayed, “If you indeed created me a woman, you can change me to think and act like a woman. I will surrender.” But through the years I only found myself growing into manhood instead of womanhood. God did change me–to be a better person that I could never be by my own might. Holy Spirit convicted me guilty in regard to my sin, but not my gender identity. Blessed is the man who does not feel condemned by what he approves (Romans 14:22). I realized it`s not humans’ business to decide what is sin, it`s God`s. Thus, I kept my faith between God and myself. However, I never had the courage to come out to any other Christians in China. It was often preached that homosexuality was sin in my church, while being transgender was never mentioned. I suspect it is only because they don`t know the word to refer to this marginalized population. There was a pastor who once shared, “In America, if you are a man and think you are a woman, you can visit the ladies` room, and vice versa.” Hearing this, the congregation was shocked into a hush. Had I been born “normal, ” I believe I would be like them, pointing at LGBT people with a sense of moral superiority. Since I`m transgender myself, I know the case is just not simple as that. I didn`t know what an affirming church was like until I came to America and visited Beavercreek United Church of Christ (BUCC). The first time I stepped into the church, people came all around to shake hands, to greet me, and to talk to me. Their messages and praises echoed in me, and they accepted me as Christ did. Even after they learned I was a trans man, they didn`t change the way they treated me. At BUCC it was said plainly to me, “You are a man.” I saw how acceptance and love can build up a person. 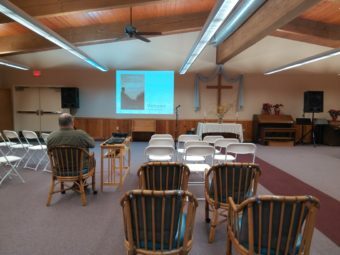 On Feb. 8th, I did a book reading at BUCC with my church family and a couple of transgender friends as my audience. Standing before the microphone, stripped of what I think of myself, simply presenting as what I am, I was totally at my peace to share my story. My audience smiled, frowned, and chuckled as I read. For a moment, I truly lived as my authentic self and spoke out loud. It was a moment that I can recall with happiness because I was surrounded by unprecedented support. At the end of the book reading, everybody came to the front, laid their hands on me, and Pastor Jennifer led a prayer for me. My eyes were wet as God confirmed his love for me once again. With this proof, now my steps are even firmer.